Collaboration between painters was a habitual practice in both Holland and Flanders. The specialisation that had come about in painting in various genres that became fully independent in the 17th century encouraged these associations between two or more painters, although we already have important examples of the division and organisation of artistic activity dating from the previous century. These copper plates are the result of collaboration between two painters, who both signed them with their names. David Teniers II painted the figures and Jan van Kessel I, an artist who specialised in still lifes with flowers, insects and animals, executed the decorative borders that frame both episodes. In the case of Teniers, these two panels are interesting works that allow us to appreciate how the artist approached a historical theme, which was a relatively uncommon type of subject within his oeuvre. Teniers and Kessel worked together on other occasions. These oils, together with the remainder of the series to which they belonged, may have been commissioned by two members of the Moncada family: Luis Guillermo de Moncada or his brother Ignacio de Moncada, as a wedding gift for the marriage of Fernando de Aragón y Moncada, heir to the family title, and María Teresa Fajardo de Mendoza y Rivera. The paintings remained with the family until 1870, at which point they were auctioned in Paris. Before reaching the Thyssen-Bornemisza collection they were with two dealers in Paris and were in a private collection. They were also auctioned in New York and were with the Scheidwimmer gallery in Munich, from where they were acquired for the Collection. The two copper plates were part of a series of twenty panels that narrate the deeds of two Sicilian noble brothers of Spanish origin, Guillermo Ramón Moncada and Antonio Moncada. Twelve scenes are devoted to the former, painted by Willem van Herp (six), Luigi Primo il Gentile (five), and Adam Frans van der Meulen (one). Antonio Moncada is the subject of the eight remaining panels that were commissioned from David Teniers II, who painted them shortly after the first half of the series was completed. Jan van Kessel was commissioned to paint the decorative borders of all twenty panels. The episodes depicted, in which the two brothers are the principal protagonists, take place in Sicily around the end of the 14th and beginning of the 15th century. The compositions resemble tapestry cartoons and in fact we know that six of the panels on the subject of Luis Guillermo Ramón Moncada were used for this purpose and provided the bases for tapestries woven in Flanders. 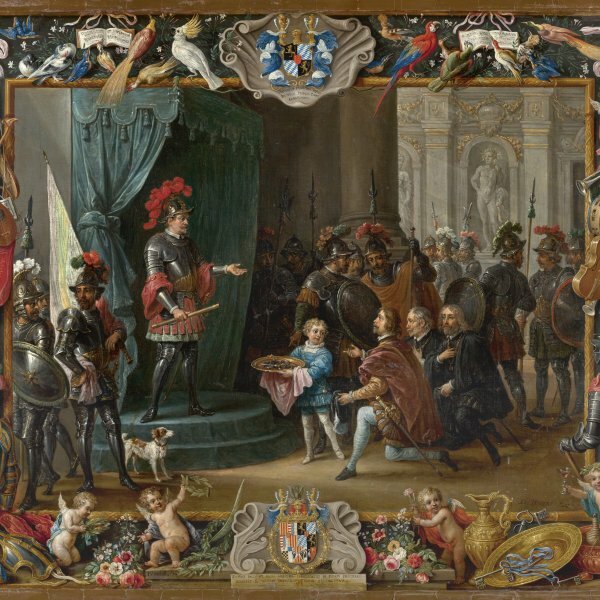 In the first of the present two panels, Antonio de Moncada, having defeated the rebels, represented by two kneeling men in the foreground, receives the keys of the city held by a young boy on a tray. Wearing ceremonial armour and holding the baton of captain-general in his hand, Antonio de Moncada accepts the gift, standing under an ornate blue canopy. Teniers completes the scene with other figures wearing decorative armour, using two sources of light, one in the background of the scene in which he locates various groups in a classical-style setting, and the other illuminating the principal scene in the foreground. The border by Van Kessel has six small putti playing or holding objects such as a glass of wine, flowers, crowns or swinging from large ribbons. The musical instruments, pieces of armour, flowers and two concerts of exotic birds at the top provide a brilliant framework for the historical episode. 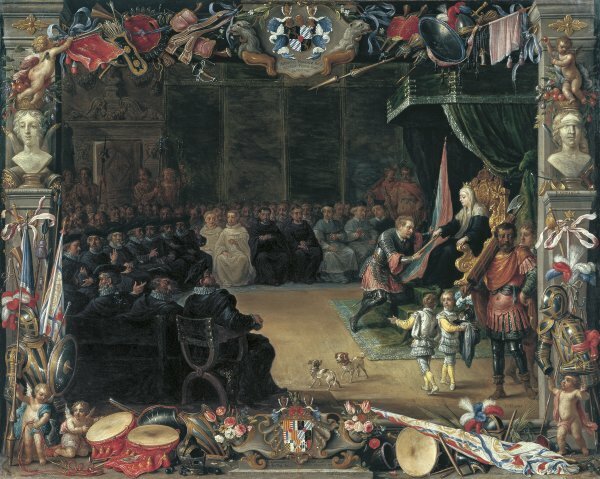 The second panel, which depicts an episode that chronologically took place prior to that of the keys, depicts the presentation of the baton of captain-general to Antonio Moncada by Queen Blanca of Sicily. As in the previous scene, the events take place in an interior, but here the solemn event is witnessed by a large group of prelates and other dignitaries gathered before the queen’s throne. In this case Van Kessel decorated his border with putti and numerous objects and instruments relating to war, including coats-of-arms, lances, swords, arrows and standards, as well as various military musical instruments such as drums and trumpets. Van Kessel framed the scenes at the sides with pilasters and two busts symbolising Justice and Liberalitas Regis. The copper plates that complete this series on the Moncada brothers are now divided between private collections and the descendents of the Marquis of Villafranca.